ESPN announced yesterday that Brett Favre is calling it quits. Man, this dude has rained on my parade and made my day over the years. I've seen him demolish my BEARS and I've seen him get demolished by my BEARS. Favre is a true gunslinger. I've never seen a QB make plays out of nothing the way he did. I've loved him and I've hated him at the same time. It's a sad day for the NFL and sad day for Packer Nation. A great QB is hangin' up his spurs as a nation of green and gold mourn. I actually teared up when I saw it on ESPN. I almost feel compelled to buy a Favre jersey and wear it when he gets inducted in Canton on the first try. 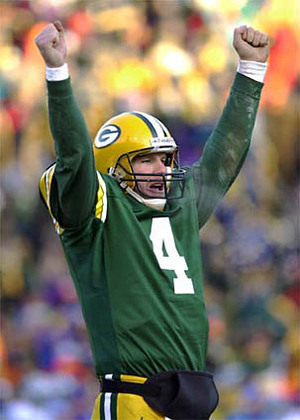 Thank you Brett Favre for 17 years of fantastic football in the NFC North. Lambeau field will never be the same. *I wonder if this is how Baltimore felt when Johnny Unitas called it quits? i like that you spell it BEARS. dude, come to the wine hole! i work tonight. i got into phd. i am waiting on one other school they are slow bastards but they offer a better assortment of mentally ill people for me to poke with a stick, i mean develop my clinical skills with. when this is all done i am having a party where we will research how awesome whisky is.